I inwardly sighed last week when my wife suggested that we watch the 2015 Robert De Niro and Anne Hathaway comedy The Intern on HBO Now. One has to admit there are problems with the film’s setup. Robert De Niro plays Ben Whitaker, who is a retired, widowed, 70-year-old who spent 40 years climbing the corporate ladder at a telephone book publisher. He applies for a “senior internship”* offered by a hip start-up, About the Fit, which has set up its open-office, iMac- and MacBook-heavy workplace in the building where Ben’s factory used to make the now-obsolete phonebook. 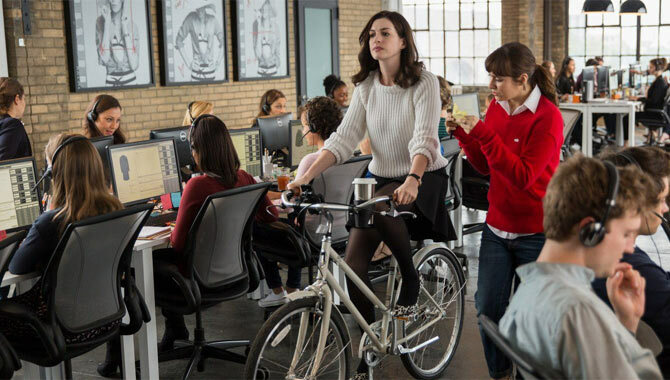 Ben gets assigned to the company’s CEO, Jules Ostin (Hathaway), against her will, and he slowly, patiently, gracefully helps her navigate her thoroughly conflicted work and family life. The Intern suggests that the phonebook is dead but that Ben’s classic charm, sophistication, and loyalty can bring grace and peace to even the most FOMO-inflicted of millennial entrepreneurs (even one who lives in Brooklyn!). Wait, stay with me. I know it sounds too precious and predictable, and it is true that Ben and Jules represent types that are probably are rarely seen in real life. Ben is a consummate businessman and gentleman: cleancut, modest, quiet, and brave. Jules is everything we hope to see in our tech entrepreneurs: hardworking, detail-oriented, humble, good at coaching, and family-oriented. As you might expect, Ben is a the emotional rock, and Jules is a wreck. The twist here is that Ben handles his role with easy, strong, and gentle grace. As Jules’ personal life spirals out of her control, Ben is the one who sticks by her side. Most importantly, he is a good friend to her. Simply put, there’s no suggestion in this movie that older people can’t be friends with younger people, or that men can’t be friends with women, or that the 1950s were the golden age of manliness and women now wanting both career and family are deluded. Ben encourages Jules to do the right thing for her family and her business and then supports and defends her choices in front of other people. I think the reason I like this movie so much, cheesiness and all, is that my view of friendship has been thoroughly corrupted by the church. The pulpit and the small-group podium tend to focus on relationships that directly benefit oneself, e.g., accountability partners, mentors/mentees, ministry/business partners (only difference is the IRS status). There are also a number of disturbing laws of friendship: no mixed-gender friendships, no associating with losers or whiners or non-Christians (unless you’re there to build them up or evangelize them). The concept of friendship as a conduit for everyday grace (rather than counting laws and advancing oneself) currently receives suspicion and even contempt in the contemporary American church. Mind you, this is not restricted to evangelicalism. I have heard some version of the guidelines listed in the paragraph above from many pulpits representing all the major branches of American christendom. The common source, I think, is the cultural acceptance of–even adoption of–self-help culture by church culture. When we go to a worship service or a small group or a men’s/women’s group (because clearly, all manner of foolishness would transpire if they met together on a Wednesday night), we expect to hear some way to be better. As a result, we want, expect, and receive teaching and advice that turns friendship into a project to achieve rather than a conduit for grace. Consider accountability partners. The term comes from 12-step programs and has real utility in that context: you may be less likely to revert to substance abuse if someone checks in with you periodically. Mentors and leaders can provide a softer, somewhat less personal, but useful service to mentees, employees, volunteers, etc. A 12-step accountability partner or a corporate mentor can indeed become one’s friend, but that is not the goal of the initial setup. The argument for importing accountability partnership into regular friendship is that (a) we sin every day, (b) God calls us to greater perfection, so (c) we need someone to constantly challenge us to follow the law more carefully. Friends can provide that sort of accountability to each other when needed, but their relationship should not be reduced to this function. Who wants to have a designated judge whose scope is “all the sin in my life,” i.e., “practically everything I do”? Who wants to serve such a role for someone who probably just needs a buddy to go see Star Trek: Beyond and Batman: The Killing Joke with him, to pick a totally random example? In The Intern, however, Ben never uses Jules as a project, a notch in his salvation belt, a rung up the law ladder, a means to an end (spiritual or otherwise). He simply, straightforwardly, gives Jules the encouragement and support that she needs at a difficult time of transition in the professional and familial spheres of life. Nothing I have written should be misconstrued as, “Look unto Ben Whitaker; go and do likewise.” Both Ben and Jules are idealized characters. As some cranky (but not incorrect) reviewers have pointed out, neither has any visible flaws. Anyone who can be as content and kind as Ben or as energetic and caring as Jules all the time is blessed with such gifts at birth; it cannot possibly be learned. If you need to make it more realistic, imagine that there’s a sequel in production hell in which Ben and Jules discover each other’s flaws. Thinking about Ben’s kindness and even paternal care of Jules reminds me of the chapter on Judaism in PZ’s Panopticon. PZ notes that Judaism has the curious knack for producing good fathers–growing up, almost all of his Jewish friends had supportive fathers, whose relationship reflected grace alone: “Because you are my child, I am totally on your side. You don’t have to do a thing to convince me of anything. I love you simply because you are my son. Period.” There’s a bit of that in The Intern, albeit only two hours rather than the lifetimes that PZ observed. It’s just long enough, though, to get the viewer thinking of how great it is to have a God whose relationship to us is more like that of Ben Whitaker to Jules, or notable Jewish fathers to their sons, rather than the accountability partner suggested in a Christian self-help sermon. *I’ve sat through enough discrimination webinars to know that federal law prohibits discriminating on the basis of age from 40 years and older, so there’s simply no way a job ad could specify applicants 65 years and older. Also, the whole intern relationship provides a nice setup but is basically forgotten about 20 minutes into the movie.